Health Care For Kids When You Can't Afford ItEliminate The Muda! The great recession continues to linger. The good news is that unemployment is beginning to trend downward; currently at 9.7% from a high of 10.2%. Even if you have been lucky enough to hold on to your job, you were likely to have still suffered a decrease in hours, bonus or elimination of a merit or cost of living increase. Many have been forced to cut back on expenses. Some choices have been easy and had little impact on the quality of life while other choices have been painful. CBS News reported in Austin that Shaunna Terry, a real estate agent and single mother made the tough decision to forgo health insurance for herself and her two kids. This article was featured in the Yakezie Carnival hosted by Foreigner’s Finance. Please check out a bunch of other great articles there! There may be several options available depending on the community that you live and your current income level. Pregnant women and children under 6 with income levels below 133% of the federal poverty level. Some other criteria may apply at the state level so make sure you investigate fully for any opportunities. 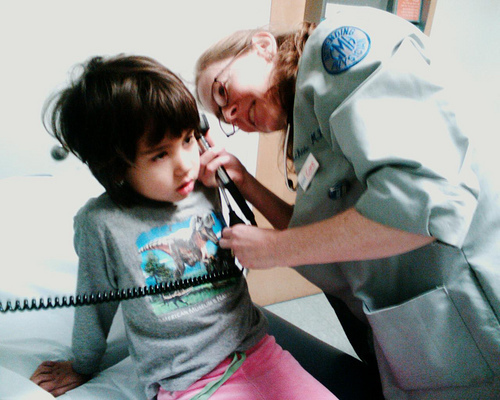 Children’s Health Insurance Program (CHIP) – This government funded program provides low cost health insurance for families that do not qualify for Medicaid but cannot afford private health insurance on their own. Participation is based primarily on income level. For example a family of 4 would likely qualify if your household income is $44,100 or less. Please check your particular state rules however as the program rules and limits do vary. Hospitals – This is a link to a list of hospitals by state. Your local hospital can be a great source of information to provide low cost and no cost care and medical support in your community. WebMD – On line resources can also be very helpful to address non-emergency health issues. If you know the definition of your ailment you can look it up directly, if not you can use their symptom checker to narrow down possible causes of your concern. Family – Don’t forget to turn to other family members. Grandma probably has lots of experience and can provide insight and suggestions on how to address common illnesses. She can also help relieve your concerns as a parent when its 3:00 a.m. and little Johnny is running a fever. We’ve been fortunate, since our son was two we have been covered by an employer sponsored health care plan. There is no guarantee that we can rely on this indefinitely. For this reason I find its worth considering the alternatives in case they are necessary. This was the list I came up with in the last 30 minutes. What have I missed? Where else would you turn for your children’s health care? Another little known trick is to just buy catastrophic insurance for the child. I have seen students as well as low income families use this. Basically the health risk is low for children and teens so you buy a catastrophic health insurance policy that only kicks in if there is a big health problem. The premiums are low. I’d never considered this but I think it’s a good idea if you can’t afford full coverage health insurance. Thankfully, we’ve been covered in the past but it’s good to know that this is an option, just in case. It definitely leads to some peace of mind. Good thread- it helps me understand the health care system south of the border a bit more. I also heard that nurse practitioners are much less costly than going to a physician, too. .-= youngandthrifty´s last blog ..If You Had a Million Dollars… =-. @Fern – Great tip, thanks for the suggestion and stopping in! @Jerry – Peace of mind is good, there is nothing more important than our kids! @youngandthrifty – Another good tip to look into, do we always need a doctor? We’re currently in this situation and found out that a low-income health plan is available on sliding scale through our county. It’s worth asking if your county offers such a service. Our kids are covered by Medi-Cal (California’s Medicaid system) and we are working through the application process for our county program. It’s a slow process! Once completed, we’ll get subsidized care with a sliding scale monthly premium and co-pay. There is no way we could pay out of pocket for health care with our current income level, so I’m especially grateful that the option is there. We have a “Convenient Care” clinic at our local hospital that anyone can use for a very nominal fee (like you mentioned). This is good for normal doctor’s visits, but doesn’t help with more serious health issues. The Medicaid and CHIP programs sound like good solutions for lower income families. I wonder if there is a system in place to tell qualifying families about these programs…do doctors and hospitals tell families? Just wondering. .-= Joe Plemon´s last blog ..Five Upcoming Tax Hikes and What They Mean to You =-. @The Saved Quarter – There is nothing that has scared me more than a sick or injured child. I am thankful that you have been able to find care for your children and thanks for sharing your experience. @Joe – Good questions! I’d bet there are some that do and some that don’t. Maybe Obama’s reforms will lead to an easier system? It is really mandatory for all nation to make a awareness for kids insurance, for all type of people whether they are economically sound or unsound. For low income people there should be a different kid insurance plan. I am really very glad to go through this discussion. Thanks for sharing this…….